Now that we’ve made it through the holiday blitz, we thought it would be a good time to reflect on the beauty of the city we call home. Sure, frigid temperatures can be unbearable right now, but let’s not forget just how beautiful Chicago can be year round -- especially during those 100 days of summer. We tracked down the most stunning photos of Chicago taken by some of our favorite local photographers during 2016, all of which make it easy to see why the second city is really number one. For your blissful enjoyment, here are a handful of our favorite shots of the windy city. View of the Chicago skyline across the lake. View of River North looking east. View of Chicago River and bridges looking west. State and Lake CTA stop, and the Chicago Theatre. View of the Merchandise Mart and Loop looking south. Aerial shot of River North and Streeterville. Chicago skyline from the north shore of Lake Michigan. Chicago skyline from Lincoln Park Zoo. Michigan Ave in the spring. Sky view of the John Hancock Center. Aerial shot of Shedd Aquarium. 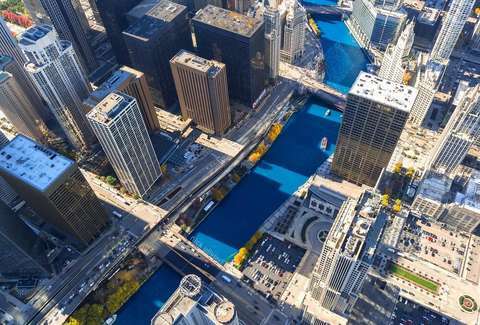 The Chicago river dyed Cubby blue. Autumn view of Cloud Gate in Millennium Park. Lincoln Park Zoo’s South Pond. Mary Bartelme Park at night. Maggie Daley Park and Lake Shore Drive looking south. Millennium Park in the fall, looking south toward the Art Institute of Chicago. Looking up toward the John Hancock Center. The view looking east toward Lake Michigan and Navy Pier. View of the Chicago River and bridges looking east toward Lake Michigan.